CHICAGO—Thunder Audio recently deployed a large-scale JBL by HARMAN VTX Series system at Lollapalooza 2016 to power a diverse lineup of high profile artists at the festival’s Bud Light stage, including Ellie Goulding, Major Lazer, Lana Del Ray, The 1975, Future, Disclosure, HAIM and many more. 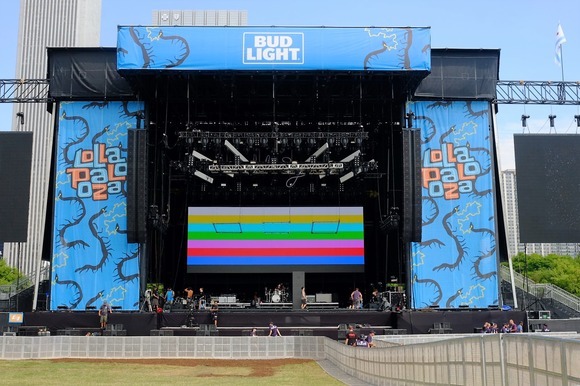 Thunder Audio used the JBL VTX system at Lollapalooza 2015, and selected the system once again for its smooth frequency response, powerful output and ease of deployment. The VTX system’s clear and transparent sound quality was especially important, and enabled Thunder Audio to accommodate a wide range of sonic requirements. The system Thunder Audio deployed included two main arrays of 18 x VTX V25-II, two arrays of 8 x VTX V25-II for outfills, 8 x S28 subwoofers flown per side, and 30 x S28 on the ground deployed in 10 clusters of 3. The entire system was powered by 72 Crown I-Tech 12000HD amplifiers and Thunder Audio used JBL HiQnet Performance Manager 2.0 software to configure, optimize and monitor the entire system. As with last year’s festival, the Thunder Audio team faced some significant challenges during deployment. The site received lots of rain in the week before the festival and the area in front of the stage retained a lot of water. Thunder Audio needed to get the system up quickly to avoid tearing up the ground. The artists performing at the Bud Light stage had drastically different sonic qualities—from intense and bass-heavy electronic sounds to rock and roll to modern pop. As an early adopter of the VTX Series, Thunder Audio and was initially drawn to the system for its versatility and its ability to produce excellent results with any type of music.